Finding a good veterinarian is one of the most important things. Preferably one who has other short-faced patients, and provide your puppy with regular checkups, routine vaccinations, tests for intestinal parasites and flea and tick control. I have been working with several vets during my years of breeding frenchies, and I am always happy to provide you with references. Your vet should do regular dental checkups and care, and you should clean your dog’s teeth regularly at home as well. There are solutions which you can add to the water supply. One of them is “Oxyfresh” . Works really well. Also, you can use dental chews, of course, with NO Rawhide, NO WHEAT or Grain. They work well as well. Simple teeth cleaning works even better . As a short-faced, (“brachycephalic”), and dwarf breed, (“chondrodystrophic”), French Bulldogs may have some health concerns that you should consider and be aware of. The short face can make their breathing less efficient than long nosed breeds. Also, in a simple case of just a slight cough or nasal discharge, should not be left unattended. because, since the nose is so short , symptoms quickly accelerate and it becomes a kennel cough from a simple cold, and then leads to pneumonia much faster than the same problem – if it happens with a long nosed breed. Frenchies have less tolerance of heat, exercise, and stress. . .all of which increase their need to breathe. Keep your French Bulldog cool in warm weather, and avoid excessive exercise. If your dog seems to overheat or become stressed too easily, with noisy breathing and sometimes spitting up foam, consult the vet and have its airway evaluated for pinched nostrils or an elongated soft palate. This is very common for the breed, just things to be aware of . Anesthesia is also more risky in short-faced dogs, so be sure your veterinarian is experienced with such breeds should your Frenchie need to be anesthetized for any reason. The spine also requires special attention. Like other dwarf breeds, the stocky French Bulldog may also have abnormal vertebrae be prone or premature degeneration of the intervertebral discs. And now days, shorter back – a better confirmation . But in reality, a longer back frenchie is less likely to have this problem due to a longer back and more room for the disks. For the most part symptomatic back problems are due to disc disease rather than to abnormal vertebrae. All dogs should have a musculoskeleta l exam by a veterinarian. I normally vet check my puppies twice before they go to their forever homes. In spite of this, most Frenchies can safely engage in regular moderate exercise, which is essential to help maintain healthy weight and good physical condition. French Bulldogs must never be left unattended around pools or any type of water body . They are poor swimmers and can easily drown due to their front-heavy structure. And it is a real threat, I have learned it from a customer. Very nice guy, who bought the puppy from me, and it was just a tragic accident. So, very important to put a fence on your pool. I also have a customer , who taught their two frenchies to swim, however, they swim under a strict supervision. Some people use life vests. They are very effective, and it is quite hard for the puppy to take the vest off. But again, it has to be supervised. French bulldogs do best in moderate temperatures . French bulldog should be carefully supervised in both high and low temperature ranges. Panting or shivering are both indications of excessive exposure. Too cold temperatures can cause upper respitory issues and eventually lead to pneumonia. Too hot temperatures lead to a heat stroke. Toys have to be carefully selected for your french bulldog, because their powerful jaws can destroy virtually indestructible toy! Chews have to be picked up carefully as well. No wheat, no grain, no artificial preservatives. Also, NO RAWHIDE!!!!! Rawhide type chews should not be used because when they soften they can become lodged in a Frenchie’s throat. Occasional brushing is good for their coats. It keeps coat shiny. Also, rubber brush is the best brush to use, it does not irritate the skin and also effective enough to brush out dead hair. Nail trimming are necessary, unless your dog wears its nails down by running. Regular cleaning of the ears are necessary. Like once a week or so, depending how fast ears get dirty. Also facial folds require regular attention. They need to be wiped with non-scented wipes on a regular basis, every day pretty much, or every other day. Cleaning them will prevent these sensitive areas from becoming irritated. I personally use playpens . They have a lot of room in them and there is enough room to put pee pads and bed. Pee pads work very well, they are usually scented and attract the puppies to go onto it. However, sometimes puppies tear the pee pads, and pee pad holder becomes handy. Some of them manage to even tear them out of the holders. Then the artificial grass becomes handy. Grass is a very good tool, easy to clean and attracts them as well. I have heard numerous reports from my customers that it helped them a lot in potty training the puppy. Also, it is very important to take the puppy in and out the play pen outside to go potty. Frenchies can not be stuck in a play pen all day long. That is very unhealthy for them, because they are highly social dogs. and excessive crating will cause physiological and as well as physical problems. A dog regards its crate home, but it has to be used properly, meaning not OVERUSED. Also, fresh water has be placed in the play pen or crate at all times. It is very useful to take French Bulldog to training classes, but it has to be done after full vaccination at 16 weeks or later. Usually, you have to wait 10-14 days after the last set of shots before going to a public place. This will get him accustomed to being around other dogs and people, will teach you how to communicate your wishes to him, and will teach him such basics as walking well on a lead, sitting, staying, and coming on command. Cute looking French Bulldog has a big personality and needs an adequate amount of training to make it a civilized companion. 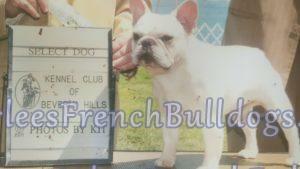 Frenchie are very trainable, but sometimes it takes a little longer and be more persistent in order to train frenchie. But overall, they are not hard to train, but not easy either. There are now many French Bulldogs who compete very successfully in obedience, rally, agility, and a few have even done field work (tracking, coursing, herding)! They can also be excellent working dogs in all kinds of Therapy Dog roles I have one of my puppies, he is a therapy dog in Santa Barbara. He has been very successful .